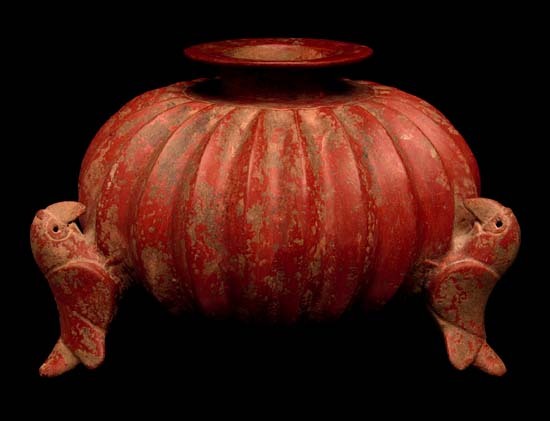 This globular vessel, supported by a tripod in the form of three parrots, each with wings folded on the back in relief, the eyes pierced and heightened by formlines, the naturalistically formed beaks held away from the fluted sides of the vessel, is pigmented with a red burnished slip. Dimensions: Height: approx. 8.5 in. (21.6 cm. ); Diameter: approx. 13 in. (33 cm.). Provenance: From a Beverly Hills, California collection formed during the 1960s.